Serving Minocqua, Woodruff and Surrounding Areas. Entering 15th year as Full Time Professional Fishing Guide and Tournament Fisherman. 1st Place Finish - 1995 Sugar Camp Classic Walleye Tourney. 1st Place Finish - 1996 Minocqua Walleye Open. 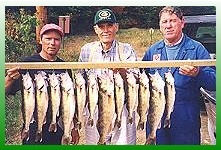 1st Place Finish - 2000 Minocqua Walleye Slam. Numerous Other Top Ten Finishes In Local Tournaments. Over the past fifteen years, Rick has spent an average of 200 days per year on the water. By spending this much time on the water, Rick has developed fishing skills that have earned him a reputation as being one of the most productive guides in the Northwoods. Spend a day in the boat with Rick and learn when and how to fish various types of structure as well as which types of bait, tackle and presentations are most productive throughout the course of the season. These and other valuable lessons learned on the trip will benefit you the rest of your fishing life. The guide trip begins by meeting at a designated time and place, typically at one of the local bait shops or restaurants. From there you'll head out to one of the area's many lakes for a day of fishing. Rates are available for a full or half day of fishing. There are literally hundreds of lakes to choose from. You'll fish comfortably out of Rick's 18' fully rigged Alumacraft Tournament Pro 175, complete with deluxe padded pedestal seats and powered by a 115 horsepower Mercury 4-stroke engine. If you have rods and reels, bring them along. If you don't, they will be provided at no additional charge. Look forward to a pleasant day on the water. 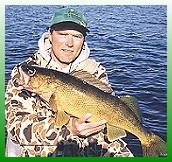 You will sit back and enjoy the Northwoods' fishing experience. Rick does all the work, from controlling the boat, baiting your hook to filleting your catch at the end of the day. Fish when you want to and kick back, relax and enjoy the scenery when you feel like it. "I have fished with Rick several times a year, since 1988. Whatever the season, and regardless of the wind and weather, Rick has the knowledge and technique to put you on fish. He makes for fun and productive days on the water"
"Fishing with Rick has been a most enjoyable experience for our family. In the Last 11 years we have fished with him on at least 20 different lakes in the area. 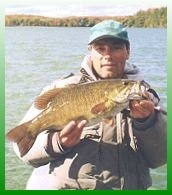 Rick has an excellent knowledge of the lakes, is easygoing, patient and adaptable. He has a love and appreciation of nature and wildlife. 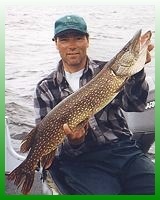 You will enjoy your 'Rick Writz Fishing Experience'." Need a great gift idea for the special sportsperson in your life? How about a "Rick's Guide Service Gift Certificate"? I guarantee they will love it! 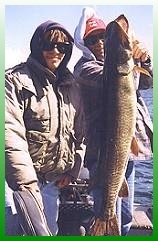 Fishing for Walleye, Musky, Pike and Bass in Woodruff, Minoqua and Surrounding Areas.